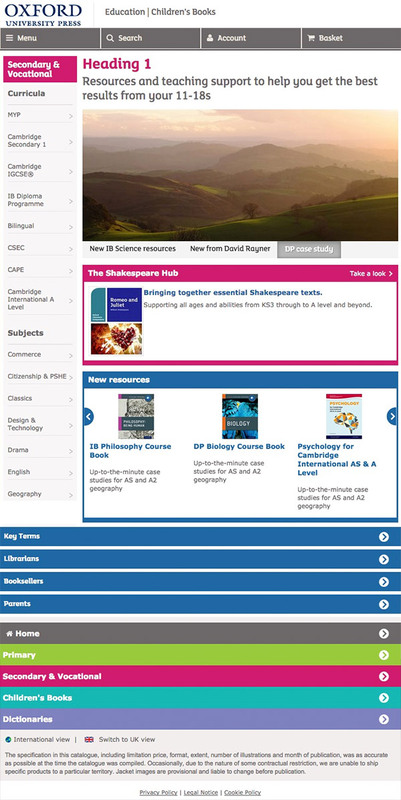 Oxford University Press’ flagship Education website was built in early 2014 by another agency. It worked really well, unless you were on a tablet or smartphone. OUP are a global company and have become aware that in many countries tablets and phones have long since surpassed desktop computers in terms of popularity amongst their clients. Originally they approached me with the idea of building a mirror website which specifically targeted mobile devices, however, I suggested that with minimal code changes I could make the current website responsive, thereby eradicating the need to run two websites with the same information. We ran a few tests with the existing code, and soon realised that this was a viable and preferable route for this website. Note: When I last checked, they had not implemented my code yet! Temporary link to my files with responsive code.